Figure SR-HH1. 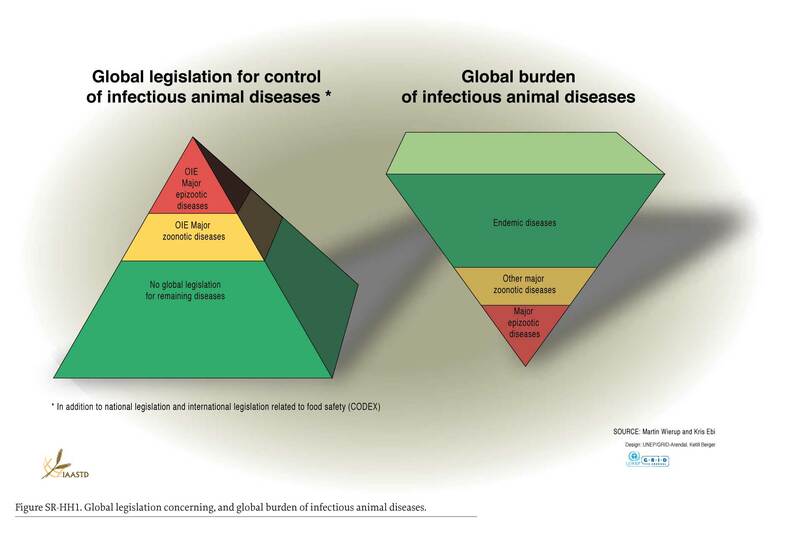 Global legislation concerning, and global burden of, infectious animal diseases. Chapter 3; NAE]. Future AKST needs to refocus on con­sumer needs and well-being, for example the importance of diet quality and diversity should be main drivers of produc­tion and not merely quantity or price. Fiscal policies should take into account impacts on public health. Agricultural subsidies, sales taxes and food marketing incentives or regu­lations could be refocused to improve nutrition and public health as a primary aim, for example by promoting produc­tion and consumption of more healthy foods such as fruits and vegetables. AKST could improve dietary quality by reg­ulating healthy product formulation through legislation or taxation (e.g., higher sales tax for food/foodstuffs known to cause adverse health effects, or limiting quantities of specific foods). Regulation may be necessary if voluntary industry codes are unsuccessful as has been the case in Sweden (ban­ning of the use of transfats in processed foods) and the UK (reducing quantities of salt in processed foods). Other op­tions for tackling nutrition-related chronic diseases include international agreements on and/or regulation of food label­ing and health claims of products to ensure the marketing and labels are scientifically accurate and understandable for all consumers [Global Chapters 1,3; NAE Chapter 2]. Such intersectoral polices should be designed and implemented alongside local and national public health action to maxi­mize impact. a broad agroecosystem health approach. Examples include good agricultural practices (GAPs) and good manufactur­ing practices, integrated pest management, biological con­trol of pests, and organic farming. These approaches, along with regulatory frameworks, can inform effective and safe pest and crop management strategies to manage the risks associated with pathogen contamination of foods. Imple­menting GAPs may help developing countries cope with globalization without compromising sustainable develop­ment objectives. Hazard analysis [risk assessment and food chain traceability] can enhance biosecurity and biosafety, disease monitoring and reporting, input safety [including agricultural and veterinary chemicals], control of potential foodborne pathogens, and traceability. Sanitation systems throughout the food production chain are integral to man­aging the risks associated with pathogens. Also needed is effective education of consumers in proper food handling and preparation. However, AKST can increase the risks of food safety when technologies are applied without effective manage­ment of possible health risks. An example is the increasing use of treated wastewater in water-stressed agricultural sys­tems in developing countries, where local communities have experienced increased rates of diarrheal diseases when either technologies or pathogen-contaminated wastewater outputs were used without effective controls.